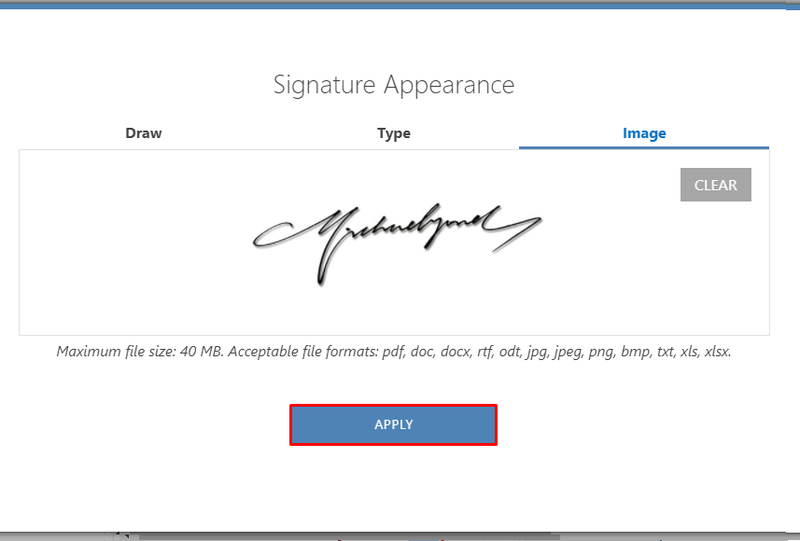 In case this is all new to you, let’s clarify what an electronic signature is. In the olden times, we would sign contracts with ink. Files would be sent via email, printed, signed with a pen, scanned and emailed back. An electronic signature is a digital representation of this process, with all the legal authority that comes with penning your name to a document. Then there are digital signatures. It can be confusing because electronic signatures and digital signatures are not the same. We have a great article clarifying the difference between digital signatures and electronic signatures. The short version is that digital signatures are great for when you need to sign a document, but collaborating remains a challenge. This is where electronic signatures come into play. The entire system was designed to have the fewest number of steps possible, ensuring a quick and easy signing process regardless of the number of collaborators. To help visualize the procedural difference between the two signature flows, you can download this PDF showing a step-by-step of what happens behind the scenes. 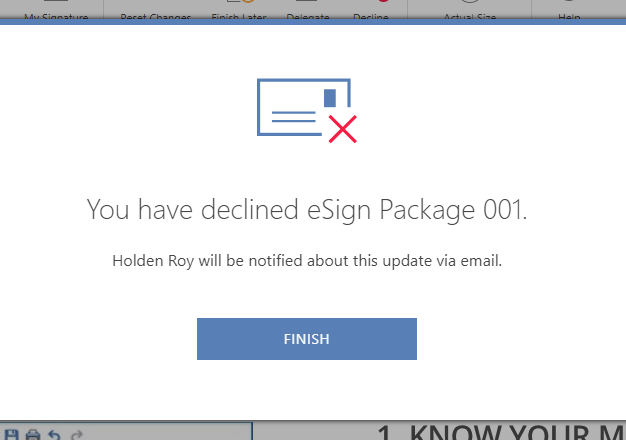 An application like Soda PDF will provide you with all the tools you need to create a “document package” with their E-Sign module. A document package is the group of PDFs you are sending off to get signatures. 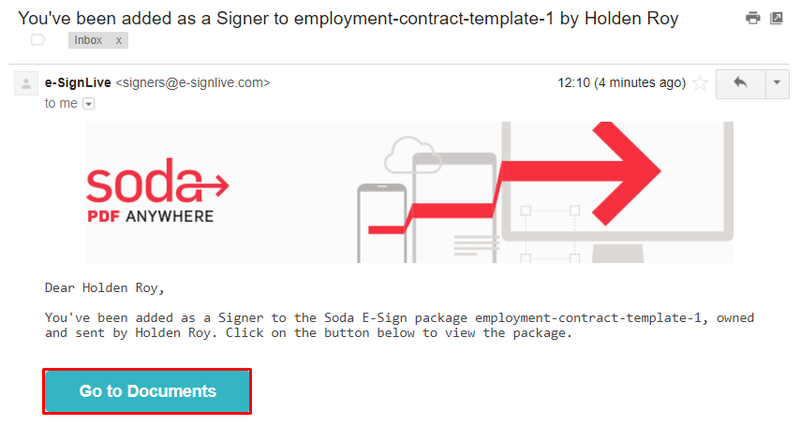 We wrote another article that covers how to create an E-Sign package in Soda PDF. Each signer will receive an email like the one below. Click on Go to Documents in the email. Click on Start Signing to accept and begin. You can now go through the document package and begin signing. On the left-hand side, you will see a count of all the required signatures along with a summary of documents in the package. Before you sign, you can set up the aesthetic side of your signature. Under Type you can choose from one of the available font options. You can update your name or initials. Click on the font style you want to use. 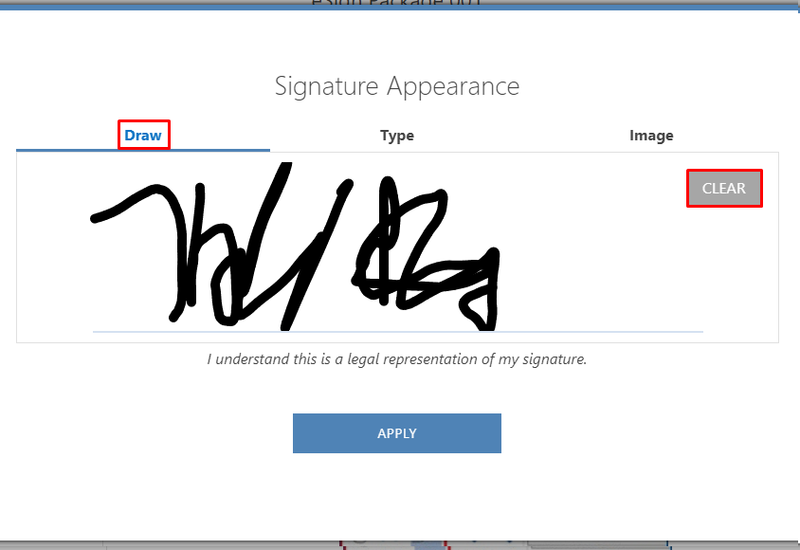 Under Draw you can use your mouse (or touch screen) to create a digital representation of your actual signature. Hold down your left mouse button and drag the cursor to add your signature. Click on CLEAR to start over. 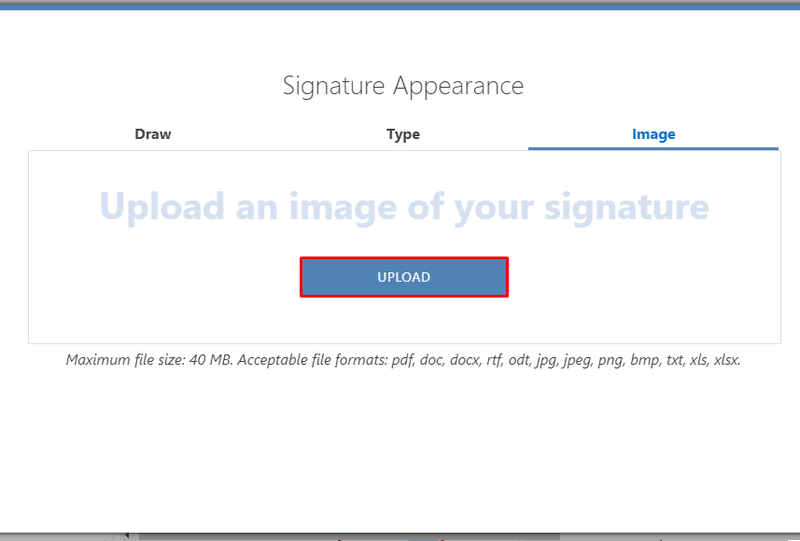 Under Image you can import an image of your signature. Browse your computer for the file you want to use. The image will appear in the window. Regardless of the option you have chosen, click APPLY to confirm that signature style. You will see each signature field in the document along with an arrow drawing attention. You can scroll through the document to review it before signing. If you are having trouble finding the signature field, there are a couple of ways to get to it. You can click GO TO NEXT FIELD. Alternatively, click the button below the number of required fields. Click on the signature field. The field will update with the signature design you chose. Click GO TO NEXT DOCUMENT to continue. If there are more fields in the same document it will say GO TO NEXT FIELD. 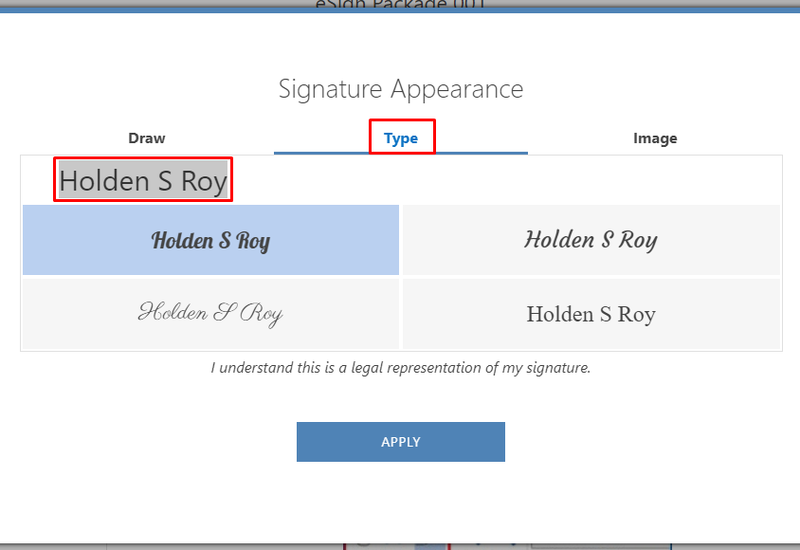 You’ll be brought to the next signature field and you can continue signing.Those are the steps on how to electronically sign a document, now onto the signer options. At any time, you can start over. You will see the notification below advising you that any progress you’ve made will be undone. You will be brought back to the beginning of the document package and all signature fields will be reset. You have the option to save your progress so you can continue later. You will see the popup below advising you that your progress has been saved. You can go back to the email we sent about this signature request and click the link to continue signing. 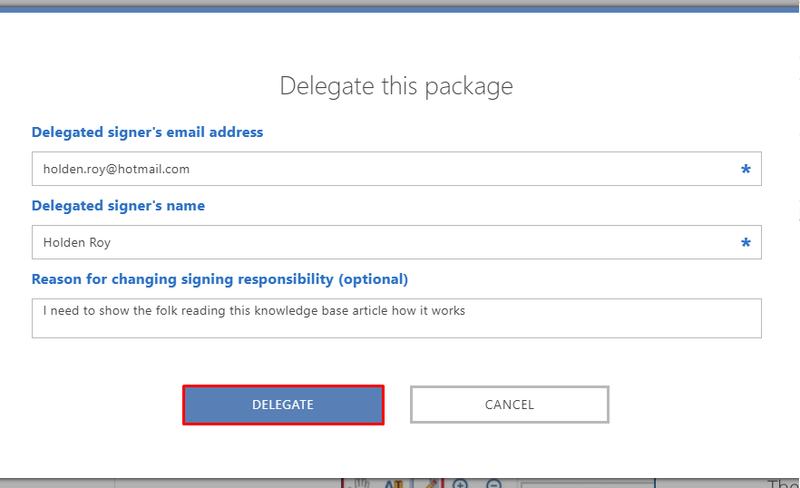 The person who created the document package can turn on a couple of options for signers. They can authorize the signer to pass along signing responsibility to someone else. You will need to fill out the new signer’s information. Enter the new signer’s email address. Once you enter the name and email, the buttons to confirm will appear. You can choose to add a reason explaining why you are delegating signer responsibility. 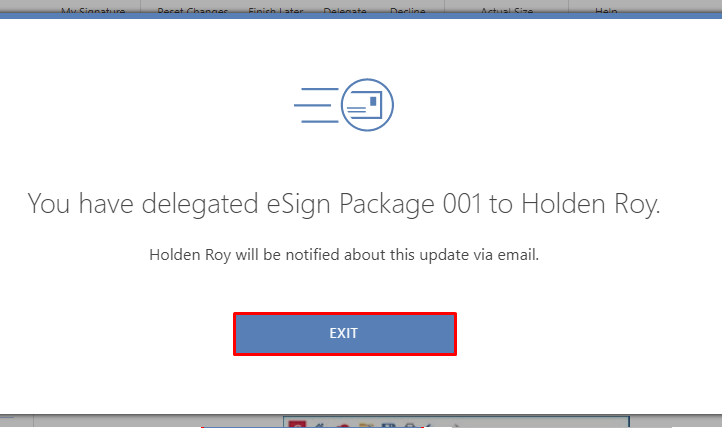 You will see the popup below notifying you that an email was sent to the new signer. The creator of the document package will also be notified by email of this change. Finally, if the option has been enabled, you are able to decline. This will cancel the document package entirely. You will see a notification confirming your action. 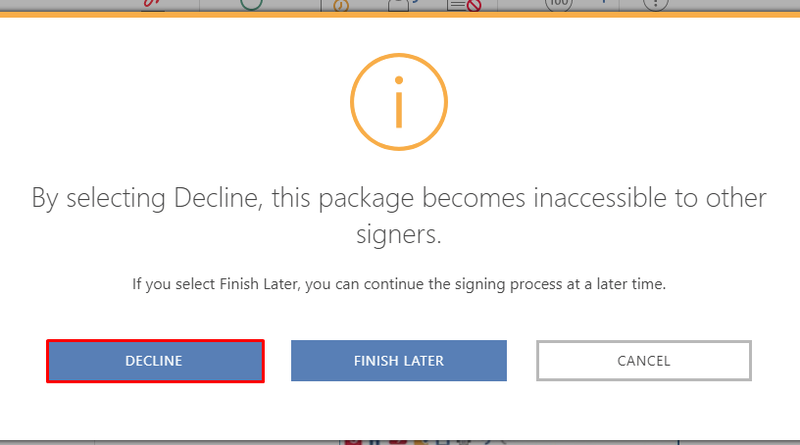 Click Decline if you want to cancel the package. Enter the Reason for Declining. The option to continue will appear after you do.